The Kiev 10 looks like something out of Barbarella and featured some cutting edge technology for its time. 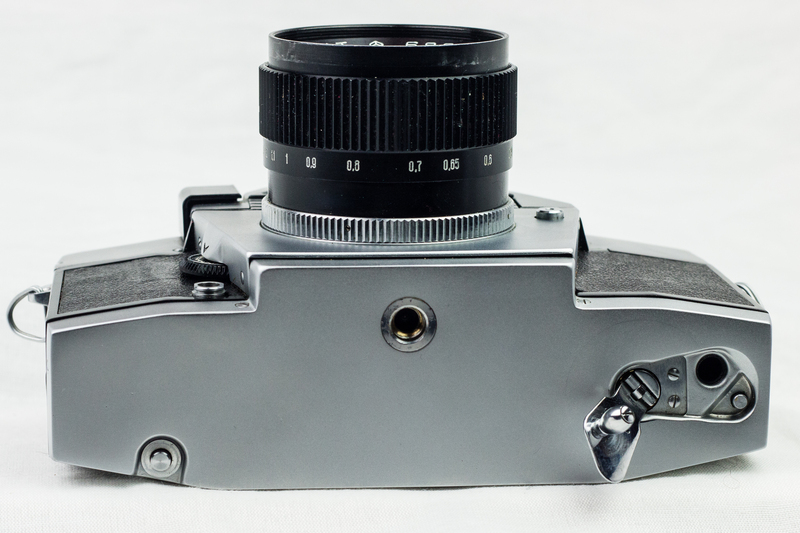 Unfortunately, the build quality was not any better than other Soviet cameras and the extra complexity means that very few are in good condition these days. 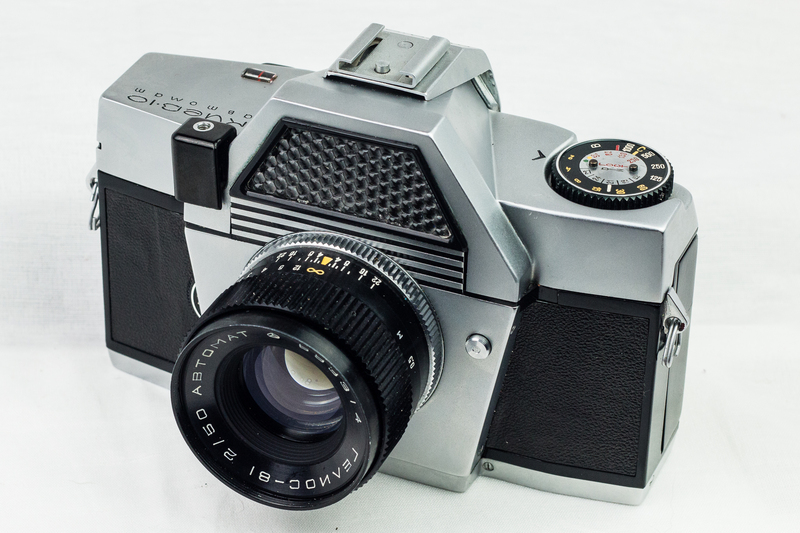 It was the first automatic 35mm SLR in the world and it was a huge departure from the previous Soviet camera industry strategy of simply copying Western designs – at the time, the 35mm offerings from the Arsenalna factory in Kyiv were iterations on a copy of the West German Contax rangefinder, the Kiev 10 was one of the first wholly original designs to emerge from the USSR. The camera uses a bayonet mount that is only shared by the Kiev 11 and 15 models so native lenses are limited. 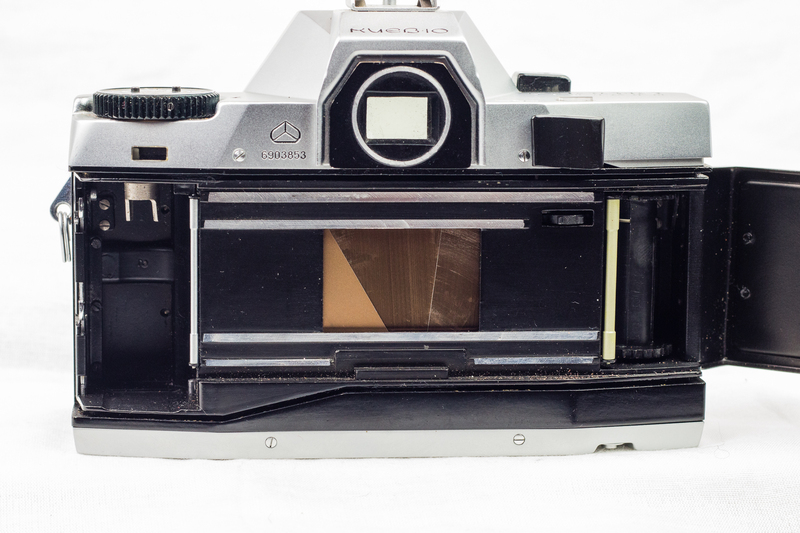 It is possible to mount m42 glass via the supplied adapter but this means that the automatic aperture selection is disabled. It meters via the large selenium cell just above the lens mount, there is no battery required. Unlike most cameras, the aperture control isn’t on the lens but is controlled via a wheel on the body next to the lens mount. The wheel lets you pick an aperture from f/2 to f/16 or the automatic mode. This mode turns the camera into an shutter priority automatic camera. 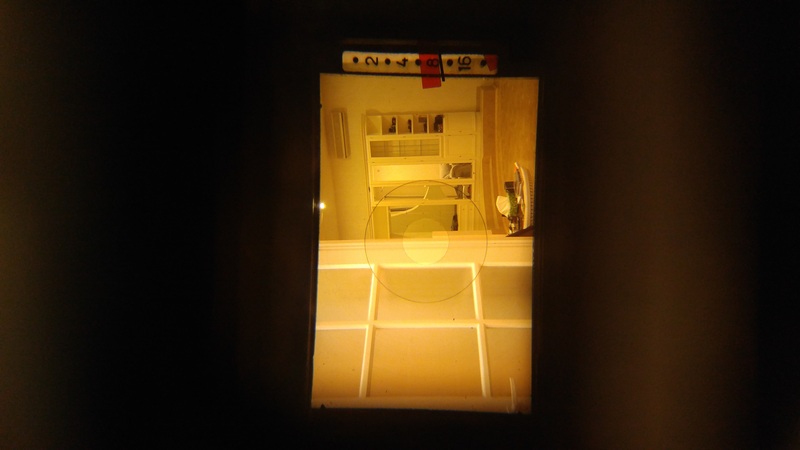 The camera will select an aperture based on the current shutter speed and lightmeter reading and displays the selection on a scale inside the viewfinder. 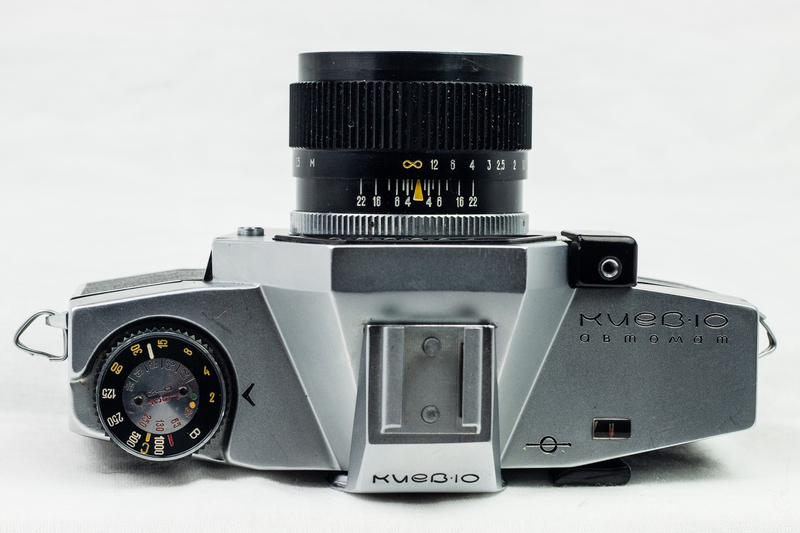 As well as having an automatic aperture selection, the Kiev 10 also eschewed the standard curtain shutter. Instead it used a metal fan shutter. This is the cause of most of the failures, it’s fantastically complex and prone to breaking. Depending on the shutter speed selected, different combinations of fan blades would swing across the exposure box. I bought mine in Kyiv from a private seller and it came in the original box with all the accessories still in their wax-paper wrappings. 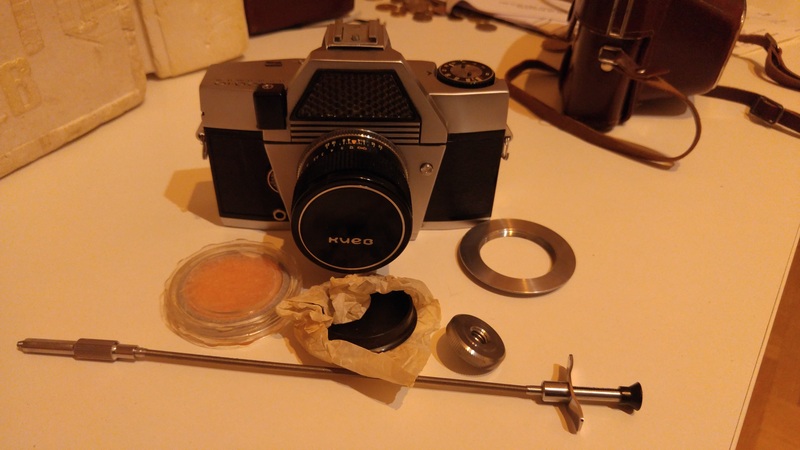 As well as the camera, you got yellow and orange filters for the standard 50mm lens, a nice, all-metal cable release, a rather ugly ever-ready case, a tripod bush, an m42 lens adapter and a removable cold-shoe. Mine appeared to have never been used when I bought it. The film rewind handle folds out of the bottom of the case and marks the case when it’s used. The lack of circular scratches around the rewind handle combined with the fact that all the accessories are intact and still wrapped point to an as-new camera. Sadly, even brand-new Soviet cameras aren’t guaranteed to work. Mine has problems with the film advance where the spacing between frames can sometimes be very erratic, occasionally it will only advance half a frame resulting in a partial double exposure. Even when it is winding on a full frame at a time, the gaps between frames are wildly variable. Other than that however, it works perfectly. I just wouldn’t bring it along for anything important. Physically the camera is huge and heavy. It’s about the same size as my DSLR and about as heavy. Compared to other 35mm SLRs it’s a beast, it’s actually heavier and bulkier than my Kiev 60 medium format camera, which is something. 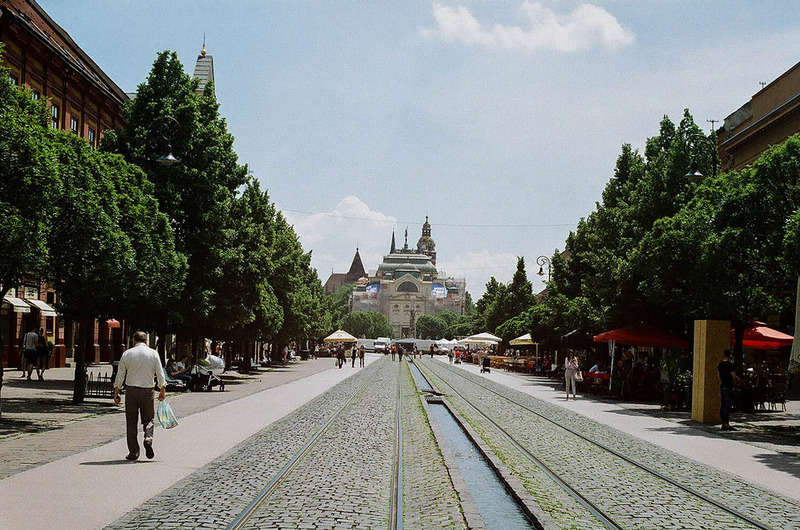 I have several lenses that are compatible with the automatic aperture selector. The standard lens that the camera was supplied with is a Helios-81 50mm f/2 lens. 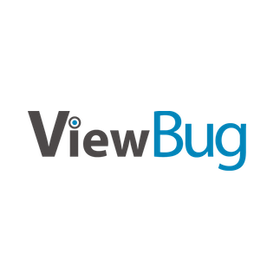 This is reasonably good optically if a bit soft wide open. I also have a Mir-1 37mm f/2.8, a Mir-20 super wide 20mm, f/3.5 and a Jupiter-11 135mm f/4. Despite the different brand names, all of these lenses were made in the same Arsenalna factory in Kyiv along with the camera and the Helios 50mm.